A north-east RAF veteran is urging the public “not to underestimate” the visually-impaired. Eddie Carroll, 66, who has the hereditary eye condition retinitis pigmentosa (RP) has spoken out about his experiences of ‘ignorant’ comments from strangers and invasion of his personal space. 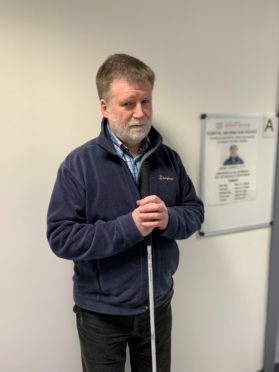 The father-of-two from Inverbervie, says he has always adopted a defiant and determined attitude regarding his eye condition – which will one day lead to total blindness – and admits that regular comments questioning his sight loss can make him feel extremely frustrated. With additional support from charity Scottish War Blinded, Mr Carroll leads a busy life as a Hospital Information Officer, helping people who have been newly diagnosed with a sight condition. He is asking for more awareness and understanding about what life is like with sight loss, with many conditions seemingly not as obvious as others. Mr Carroll, who lives with his wife of 33 years, Cheryl, and their two dogs, Brodie and Orrin, said: “I have never had a problem with my eyesight, but it sometimes feels like some sighted people have a problem with my eyesight. “For me, visual impairment is not the top of the league table of worries. He was diagnosed with RP in February 1997, and revealed he has adapted to the condition all his life – even as his sight deteriorated rapidly in the first three years following diagnosis. Sharon McAllister, Scottish War Blinded rehabilitation officer, said: “The Scottish War Blinded rehabilitation team works closely on a one-to-one basis with each of our members to ensure they feel comfortable, confident and safe in being out and about. For more information on the support that Scottish War Blinded can provide, call 0800 035 6409.